Thermal imaging is a technology that is still evolving as to its valuable and helpful uses in the building industry. The Infrared Camera can take thermal images that not only help locate areas of moisture intrusion, but air infiltration as well. 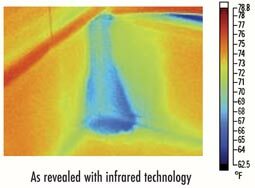 A thermal scan can be used to help with an energy audit of the home or building to asses the energy efficiency of the structure and its insulation system. 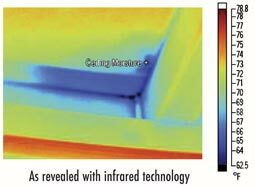 A thermal image produced from the Infrared Camera could locate leaks from HVAC ducts. A Thermal imager is an instrument that creates a picture of temperature rather than light. It measures radiated infrared energy and converts the data to corresponding maps of temperatures. Thermographs provide temperature data at each pixel (over 19,200 detectors) and typically, cursors can be positioned at each point with the corresponding temperature read out on the screen or display. How Thermal Imaging Works: Thermal (or infrared energy) is light that is not visible because its wavelength is too long to be detected by the human eye. Unlike visible light, everything in the infrared world with a temperature above absolute zero emits heat. Even very cold objects, like ice cubes, emit infrared. The higher the object’s temperature, the greater the IR radiation emitted. Infrared allows us to see what our eyes cannot. Infrared Thermography Cameras produce images of this “heat” radiation and provide precise non-contact temperature measurements. The number one fear of Home Inspectors, Real Estate professionals and homeowners is mold. Mold needs moisture to survive. 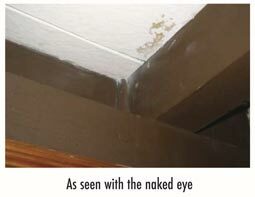 The challenge is that often moisture is concealed, sometimes deliberately, in an attempt to cover up the damage it can cause. 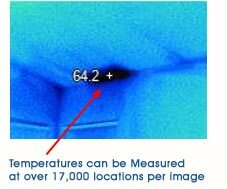 A thermal scan can reduce those fears and your liability – by quickly, accurately and non-destructively locating the thermal patterns that could be or are associated with water intrusion. Homeowner stated that the ceiling stain (left) was from an “old” water leak caused by a broken pipe in the attic. The thermal image clearly shows moisture intrusion in blue (right) is from an active leak. While cleaning the baseboards, the homeowner found water on the floor at the corner. A window sill dam test was performed. 24 hours after the dam test, thermal imaging clearly shows moisture infiltration by a failed aluminum weld at the window’s corner. Costs of energy have increased demand for efficiency. As energy costs increase, so does the demand for increased energy efficiency. Thermal imaging can be used with ease and accuracy to detect missing or displaced insulation. Replacing missing or damaged insulation can result in lower utility bills and added comfort in your home or office. During the winter at the higher elevations where the occurrence of ice damming at the eaves and perimeter walls is always possible, the IR Camera may well be able to provide a thermal image that locates the area of the ice dam in order to allow remediation before expensive damage occurs. A thermal image taken by an Infrared Camera of electrical components, especially electrical panels with breakers or fuses can graphically illuminate which electrical components or connections are faulty and/or failing with out ever having to physically contact the components. 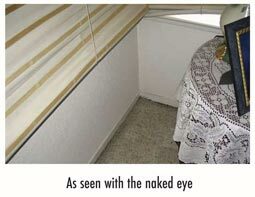 So, if you have a particular issue that may require destructive discovery (the removal of wall, ceiling or floor coverings) just to try to find the source of the issue, thermal imaging provided by an Infrared Camera my save you a lot of time searching for an elusive condition, and money in unnecessary repairs to opened walls and ceilings. Give me a call and let’s see if we can find a solution to your problem at hand.